Hacknet is a 2015 video game that allows the player to perform simulated computer hacking. The game is controlled with a combination of a graphical interface and a text based console. Hacknet simulates the Unix terminal and file system, especially for the player's local machine. It is generally possible to use either interface to perform tasks. The core of the gameplay is to connect to other computers and run dedicated programs to break the security so that you can get superuser privileges on the computer. The general procedure is to first run a scan to see what protections the computer has and then run programs matching what the scan revealed. The game notably averts the common trope of bouncing a connection between several intermediary computers before reaching the target computer. Instead a simplified system of a variable speed countdown is used to force the player to act quickly. If this countdown reaches zero, the player is given one last chance to avoid a game over by hacking their ISP and changing their IP address. Once superuser privileges have been obtained, the file system of the computer is investigated. The exact task on each computer varies for each mission, but can in general be performed by running a specific command to access one or more files on the system. A few systems have specialized interfaces, such as email systems and databases. Most computer systems contain text files that can be read. A large majority of the files are quotes from the website bash.org. The game begins with the player being automatically contacted by a user by the username "Bit". The automated message tells the player that it was sent in the event of Bit's death and asks that the player investigate his death. Bit then starts to teach you the game mechanics by way of simple missions. Bit will then tell you to join the hacking group Entropy. After the tutorial, the story largely takes a back seat for open-ended gameplay, with a mission to address Bit's fate. This mission suggests that Bit was involved in some sort of illegal activity. One of the missions the player takes on involves an opposing hacker by the alias of "Naix". They take offense to being investigated and attack the player by hacking their system. This attack is nearly impossible to defend against and if successful will result in the game GUI disappearing and the virtual computer rebooting, leaving the player with a minimal console interface. Once the player has recovered their system from the attack, the storyline of the game splits: the player can choose to take revenge on the attacker and as a reward get access to a third faction in the game, or follow the guidance of their mission control and make a statement that such behavior is not acceptable, resulting in the resumption of your missions with the faction you were in (called Entropy) before the attack. One late game mission in the game is called "Project Junebug". While the player can see it right after joining the hacking group that offers it, the mission will remain locked until all other missions have been taken care of. The mission is a request to provide euthanasia for someone terminally ill by hacking their pacemaker. As the final story arc of the game, the player breaks into the computers of a computer security software company named "EnTech". As they do so, they are faced with a security system that makes computers inviolable to the tools currently at the disposal of the player. As the player manages to find alternative ways into the protected systems, they discover that Bit was involved in a project for the company; specifically, the creation of a highly advanced operating system specialized in computer hacking. It is revealed that the plan for the project is to unleash the new operating system to the world in order to cause consumer demand for the protection system. Bit in particular was a major contributor. As the project was nearing its completion, Bit was starting to question the morality of the project. A project owner asked an anonymous figure to "discourage him." Due to miscommunication, this led to a hit being put on Bit that ended with Bit's assassination, despite the project owner's attempts to stop the murder. Once all the facts of the story have been revealed to the player, they proceed to eradicate all copies of the Hacknet project. Additionally, by command of Bit himself, they bring down the server at the heart of Porthack, the tool that Bit made. Once this final mission is completed, Bit delivers a few final, voice acted words before the game credits roll. Hacknet was developed by Matt Trobbiani, the sole developer of Team Fractal Alligator, based in Australia. Hacknet received generally positive reviews from critics. GameSpot gave the game an 8/10, praising the game for its unique presentation puzzle design. A DLC expansion for "Hacknet", titled "Hacknet Labyrinths" was announced on August 30 2016. The expansion was set to come out December 2016, however, development issues delayed release to March 31, 2017. The expansion features new hacking tools and security systems, as well as a 3 to 4 hour chapter to the game, where the player is recruited by a hacker that goes by the alias "Kaguya" into a small elite hacking team. It includes more secrets, more UI themes and a full new soundtrack, from artists such as synthwave artist OGRE and Rémi Gallego, creator of metal/electronic act "The Algorithm". 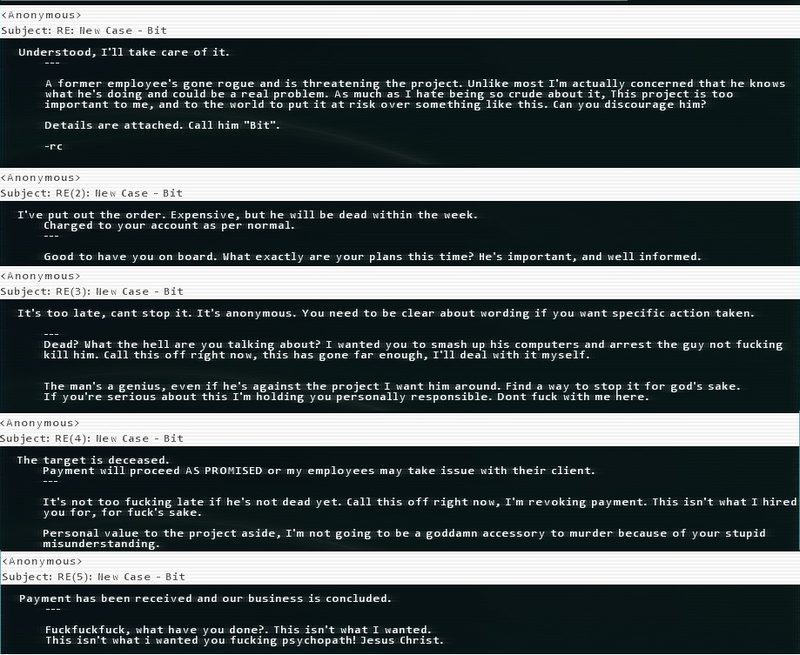 In May 2017, official mod support for Hacknet titled Hacknet Extensions was released worldwide, in which players can create their own custom stories and campaigns for the game. These extensions can be shared and downloaded from the Steam Workshop. Extensions are separate from the main game, and are accessed from a separate menu from the title screen. Hacknet Extensions also features extension-exclusive tools and the ability to implement custom music and themes. ^ Barrett, Ben (August 14, 2015). "Hacknet Released, Is A Game About Being A Hacker". Rock, Paper, Shotgun. Retrieved April 10, 2016. ^ "Bit Accidental Assassination Emails". Thunderfox.nl. September 16, 2016. Retrieved September 16, 2016. ^ Prescott, Shaun (July 17, 2015). "Hacknet is a hacking game with "real hacking"". PC Gamer. Future. Retrieved April 10, 2016. ^ "Matthew Trobbiani on developing games". abc.net. Retrieved July 15, 2017. ^ a b "Hacknet for PC Reviews". Metacritic. CBS Interactive. Retrieved April 10, 2016. ^ a b "Hacknet - Labyrinths Review". GameSpot. Retrieved 2017-04-22. ^ Caldwell, Brendan (August 30, 2016). "Hacknet Gets 3-4 Hour Expansion In December". Rock, Paper, Shotgun. Retrieved February 15, 2017. ^ "Hacknet Labyrinths Development Update". Steam (software). August 30, 2016. Retrieved February 15, 2017. ^ "Hacknet: Labyrinths Release Date & Trailer". Steam (software). March 21, 2017. Retrieved March 21, 2017. ^ a b Prescott, Shaun (2017-05-26). "Hacknet now has modding tools, so you can create your own campaigns". PC Gamer. Retrieved 2018-06-02. ^ Reema (2017-05-26). "Hacknet has become great again - Added Mod Tools Helps Create custom Campaigns | TheTech52". TheTech52. Retrieved 2018-06-02. This page was last edited on 2 February 2019, at 03:26 (UTC).